"The purpose of art is washing the dust of daily life off our souls" - Pablo Picasso I wanted to show you some of my new work I've created recently. I went through a creative dry patch over the past couple of weeks, after my new series of ocean paintings. I was SO hard on myself for not being able to paint. Probably because I'm used to painting every few days, so to go a few weeks without expressing myself was awful. I felt all trapped and stuffy. I also got panicky that I was never going to feel inspired again...LOL! I know...as if that would ever happen! Once I stopped panicking, that was when the ideas came back. It was right before we went away for a short holiday, and I'd written off painting as I needed to pack etc. It seems as soon as you stop yourself from creating, thats when the need to create comes the strongest. So instead of doing any packing, I painted for the next five hours until half one in the morning. (Oops!) This is why I thought the title, "The purpose of art is washing the dust of daily life off our souls", from Pablo Picasso was perfect. Painting after such a dry patch, made me feel like I could breathe again. And it actually felt like the dust had been washed off me. Especially as I was painting splashing waves. I loosened up with trying out an abstract piece. I love abstract art and I've never been able to do it. I feel like it's so creative as it isn't even influenced by an 'object' it just looks like feelings on a canvas. I quickly discovered the fact that, I should leave abstract paintings, to the abstract artists. But, i'm glad I tried, because I felt like it gave me these amazing ideas of painting waves in an abstract way. I seriously recommend 'loosening' up with this method if you're feeling at a creative block. I cut up my favourite colours from a magazine, stuck them in my sketchbook and used it as inspiration. Again I didn't really like the outcome, or enjoy the process. But it just goes to show that if your paintings aren't working out, try a different style. 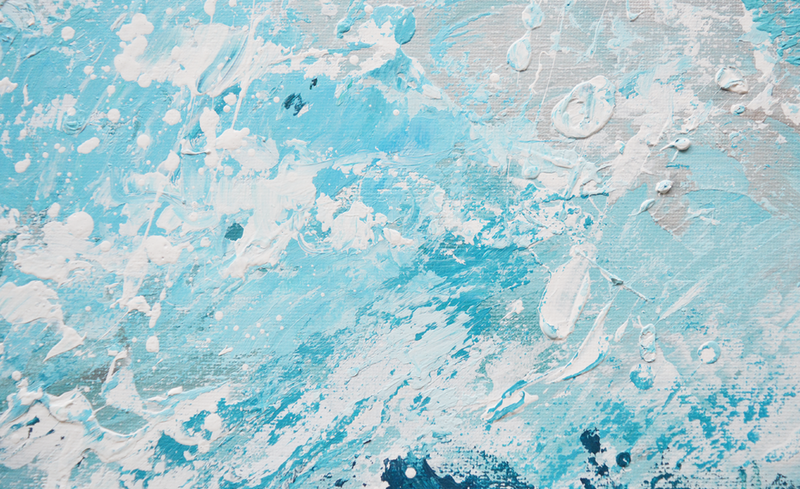 As I said, the process of creating this abstract gave me the idea to use a palette knife and fluid paint only, for an ocean painting. When I made the first one, I found I couldn't stop and now there are 13 wave paintings in this series already! Hope you like them and I'd love some feedback from you, to see what you think. You can keep following the journey of this new series with me on Instagram, Twitter and Facebook. All of these paintings are for sale, if you'd like to enquire about any, just email me at shop@katiejobling.com.